The Snug is our smaller meeting room, perfect for group meetings (up to 8-10) and one-to-ones. 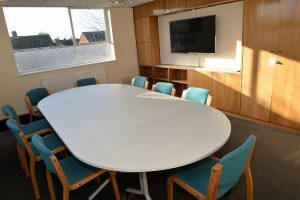 It can also be cleared of furniture for more informal, active sessions including therapeutic treatments and rehearsals. It has an HDTV for “plug-in-and-go” presentations, free wi-fi, a hearing-loop and access to our cosy Tea Room. On the first floor of Foundation House, The Snug is fully accessible, with a lift from the entrance hall.